In the Art Room: Chris Uphues Lesson for All! Hey, friends! A while ago, I created a Chris Uphues-inspired video for my sub to use. Because my classes are either 30 minutes in length or an hour, the video is broken up a bit. For example, as you watch, you'll see that my 30 minute kids learn about Chris and then do some sketching on dry erase boards before tackling paper. My older kids did this too...and then about 30 minutes in, met on the floor again to view the rest of the video. As I've said before, I LOVE having my students sketch on dry erase boards...it's their favorite because of the slick and forgiving surface. And it's mine as it uses less frustration and time with erasing and reworking. Here's that sub video...feel free to use it in your art teacherin' world. All I ask is that you give credit to lil ole me when you share your student's work or resources. Side Note: Jen and Chris Uphues are some of my most favorite folks on the planet. You'd be hard pressed to find two kinder or more down to earth people. I LOVE introducing them to my kids because I know that these are some seriously AMAZINGLY good people. And I'm super judge-y so you know I'm tellin' ya'll the true (insert winky-tongue face emoji). Meeting them this fall was one of the highlights of my school year! 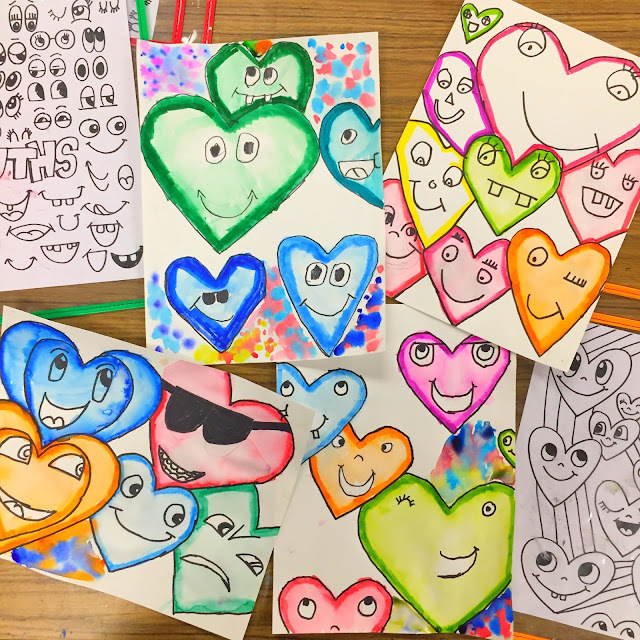 When I initially created the lesson, I wasn't sure how I wanted the kids to finish their work...just this week did we dig the drawings back up and I started letting my early finishers work on them. All my kids are in the middle of some big projects that they all seem to finish at totaly different speeds. So this lesson has been a fun and quick in-between project. 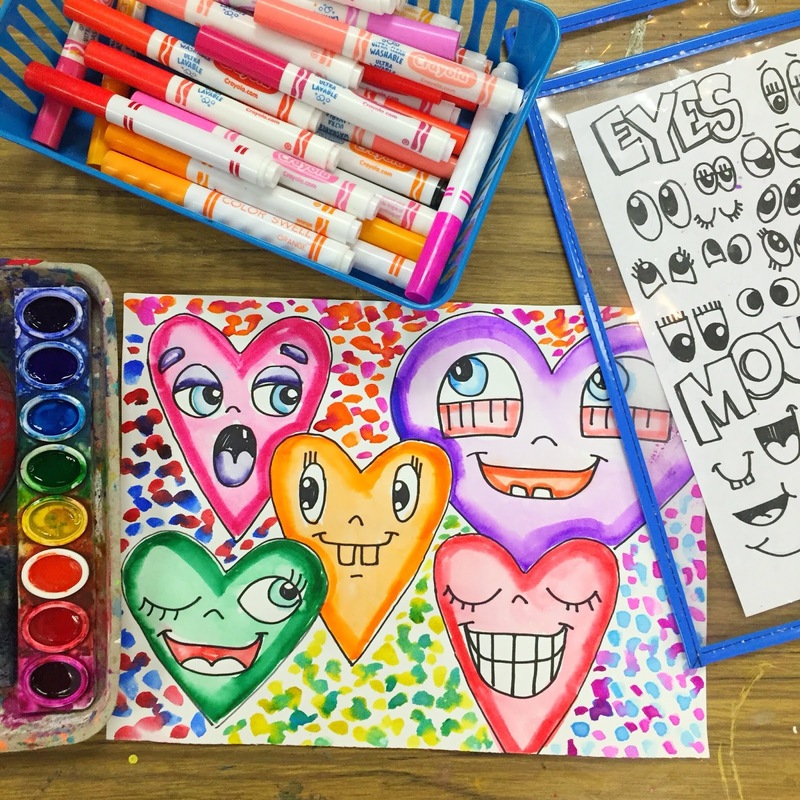 They kids love drawing these funny faces! 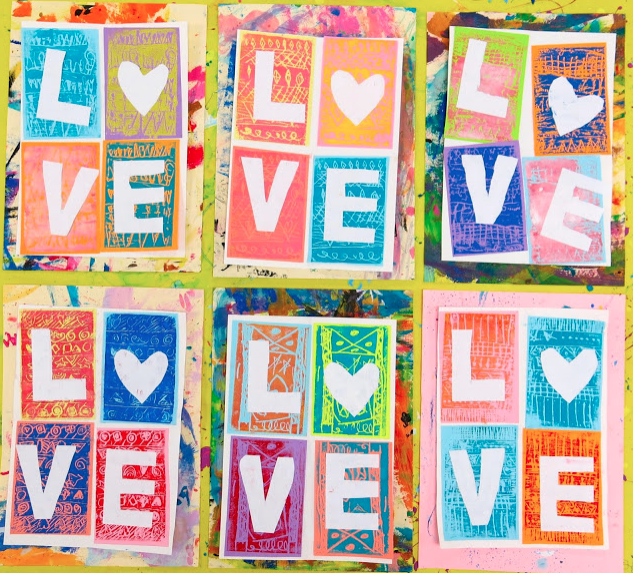 FOR THE FREE DOWNLOADABLE IDEA SHEETS, JUST CLICK HERE! 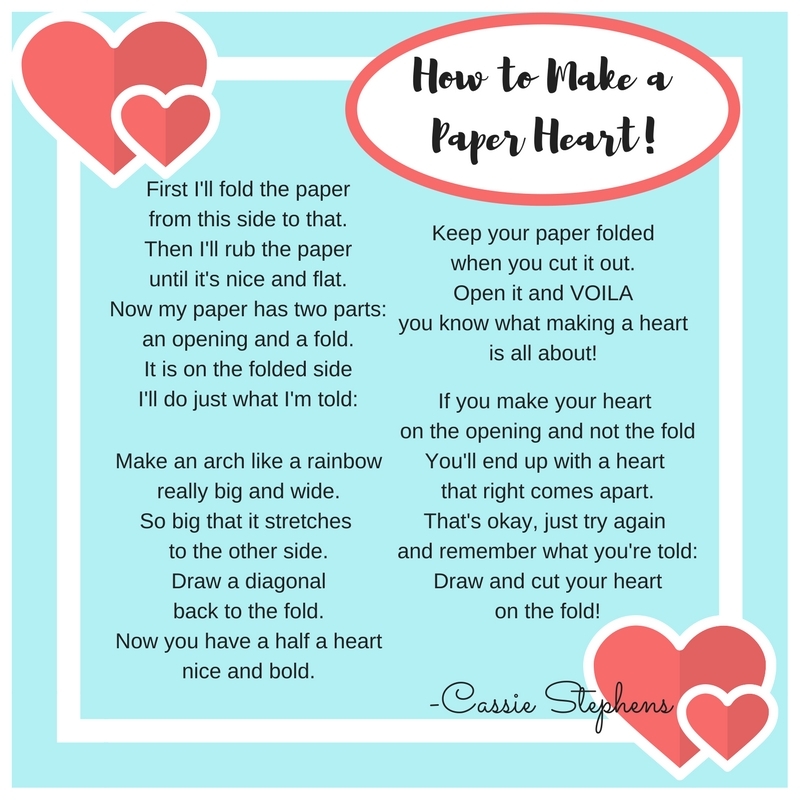 FOR THE FREE HEART SHEET, CLICK HERE! Well, hello lovies! 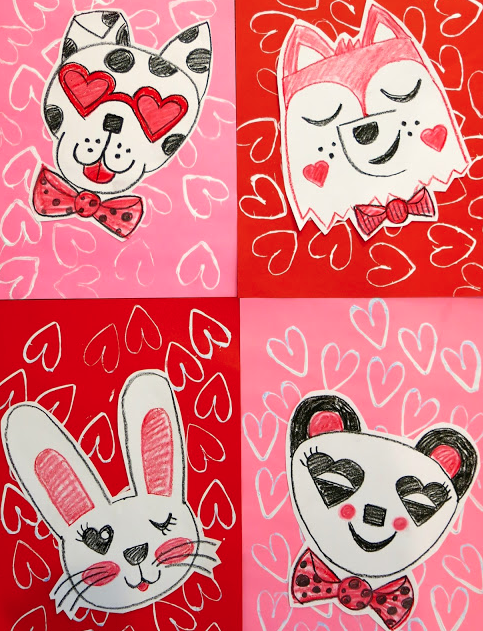 In this blog post, I thought I'd share with you 14 of my very favorite Valentine's Day inspired lessons...perfect for these chilly and cold months. 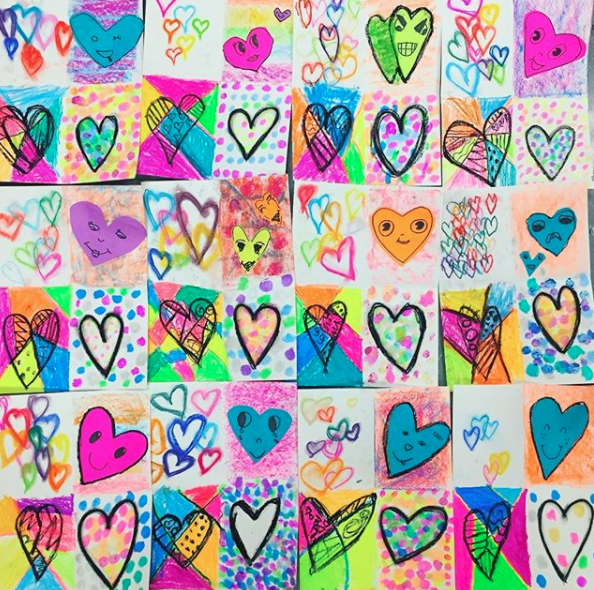 Let's let warm fuzzies abound in the art room! To find the lessons, just follow the link. Many of them have a video to share with your kids. Also...several of them are sub plan videos! Perfect if you have to take a day. I know I could use one. 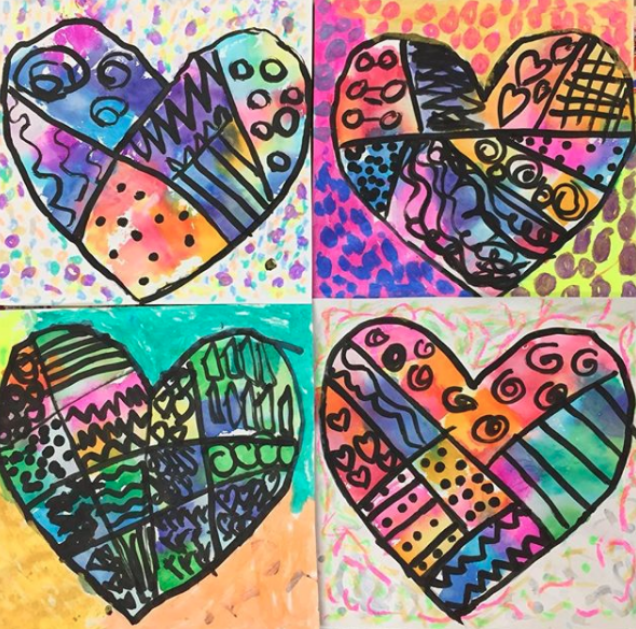 First up are these sweet Jim Dine-inspired heart sculptures created by my second graders. 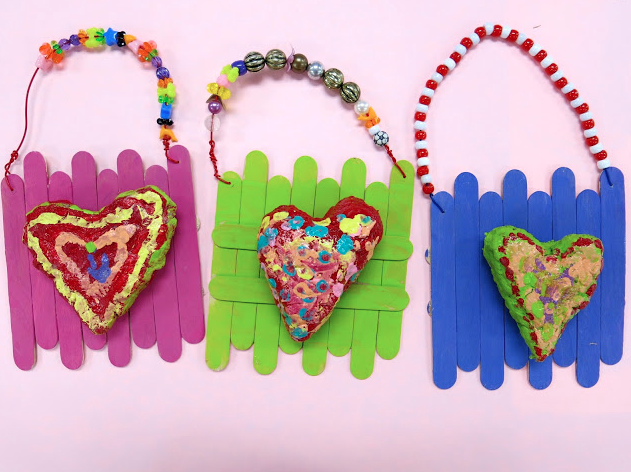 We used Celluclay and aluminum foil to make these beauties and the kids loved making them. 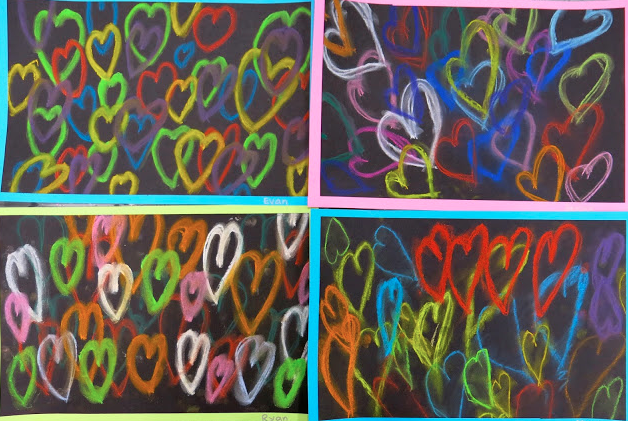 Next up are these amazing LOVE prints created by my first graders. We chatted about Robert Indiana before diving into these. 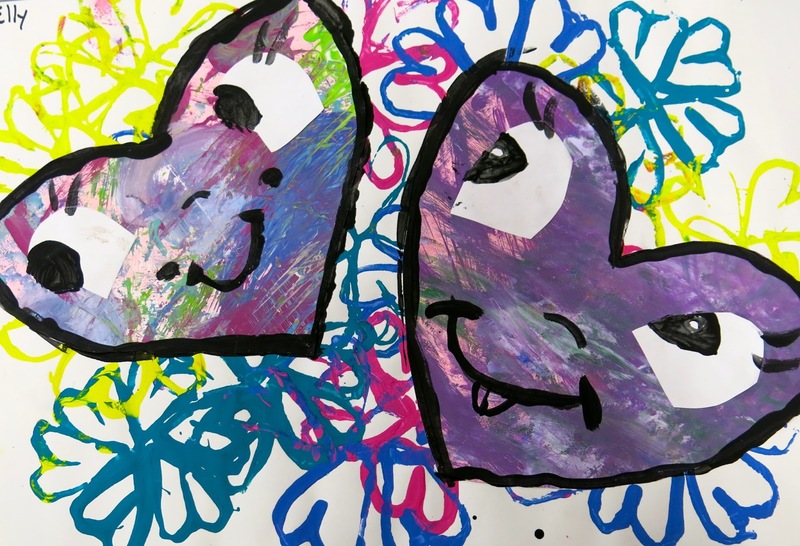 We had a whole lotta printmaking fun with this one. Last year, I did this lesson with my second graders. They were able to choose their own "kind" four letter word (we had: nice, kind, love, glow, hope, good, etc.) and used strips of paper to create the letters. Those turned out so fun. 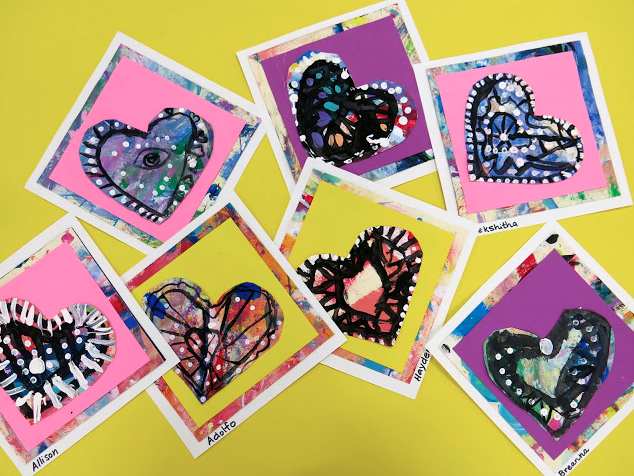 First grade artists created these huge Romero Britto-inspired hearts last year with bleeding tissue paper and paint sticks. 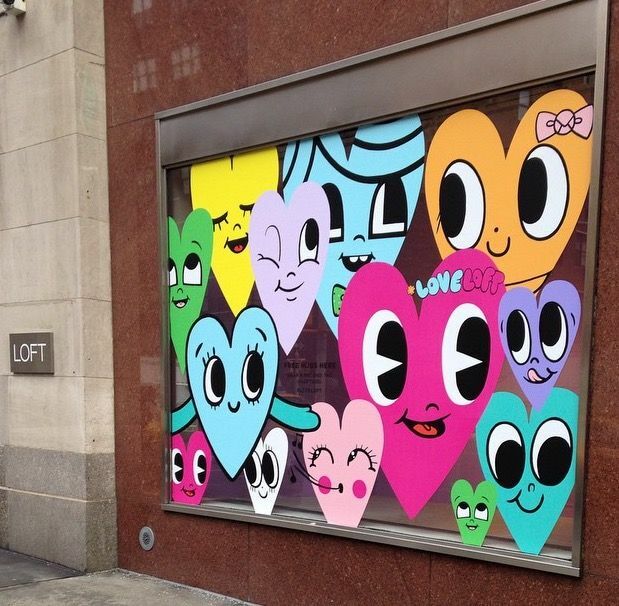 We made these on huge 18" square sheets of paper. Speaking of first grade, here's a peak at what mine are working on right now...weaving! 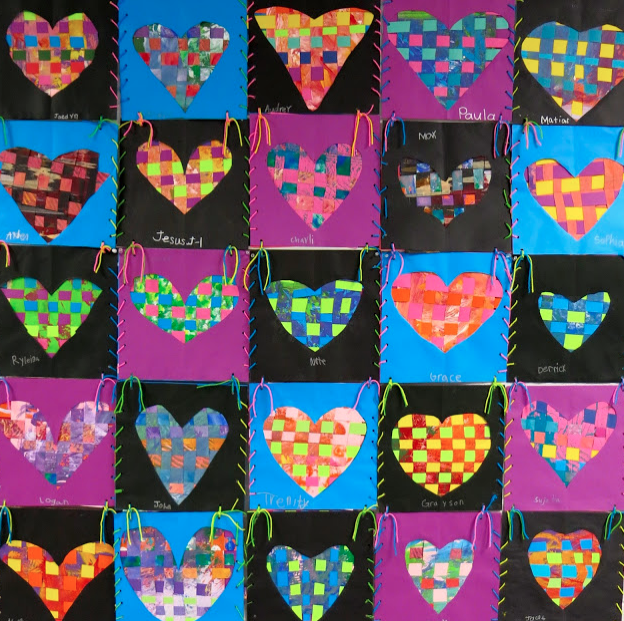 Heart weavings that we'll put together to create a faux quilt. This is one of my favorite lessons but mostly because I do love to teach weaving. Chris Uphues is one of my very favorite contemporary artists to share with my kids because 1. he's the nicest and 2. his artwork speaks to them. It's so happy! My students adored this lesson a couple years ago! If you need a quick one-day lesson that will introduce your kids to a new artist, you might want to try this one on for size. It's inspired by J. Goldcrown and all you need is black paper and chalk for amazing results. 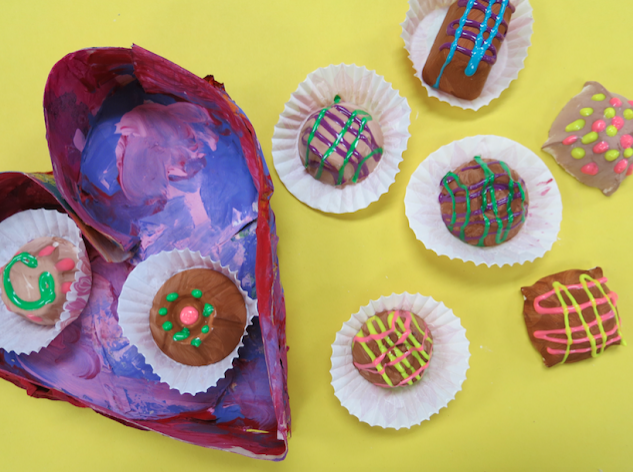 One year, we were inspired by Peter Anton's fake food sculptures to make some box of chocolates of our own. Third grade thought this was the coolest project ever. If you are like me, you do long art lessons...and then need a shorter one to pick up momentum again. I think my students might be the same way. 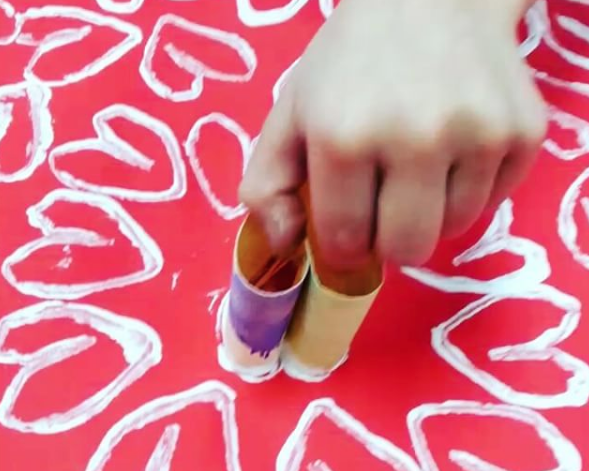 This lesson is a quicker with beautiful results. 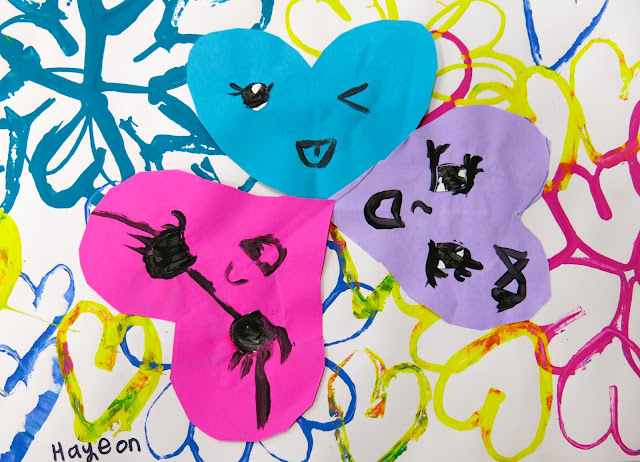 Here's what we did with the paper after we cut the hearts how: filled them with a video of tissue paper! 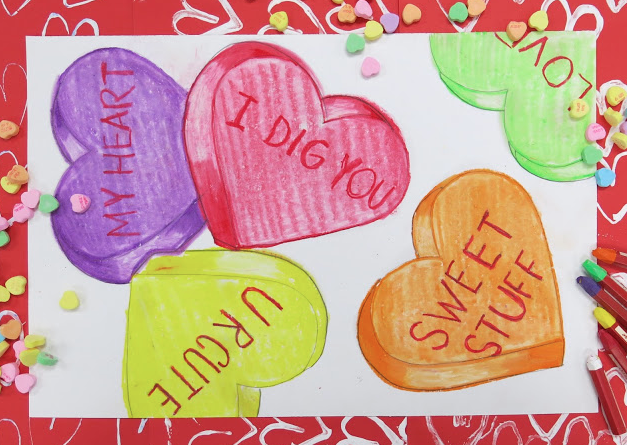 And here's what we did with the hearts we cut out. So cute, right? 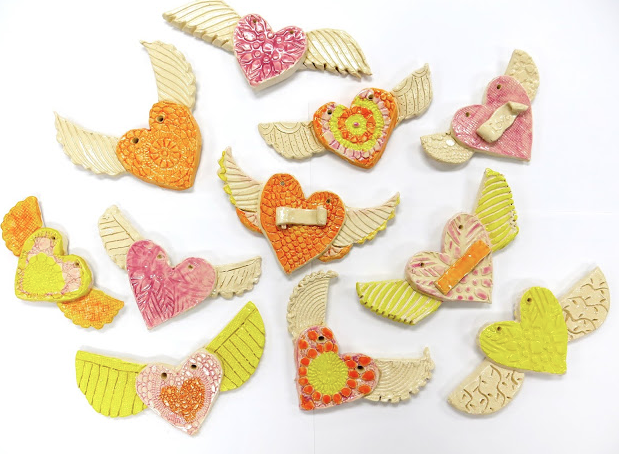 This lesson is similar to the first I shared except that there are wings added with plaster. I'm thinking of doing this lesson with my third graders super soon...just need to work out the specifics...but I'm sure they will love it. Video details and more here. Need a sub plan? 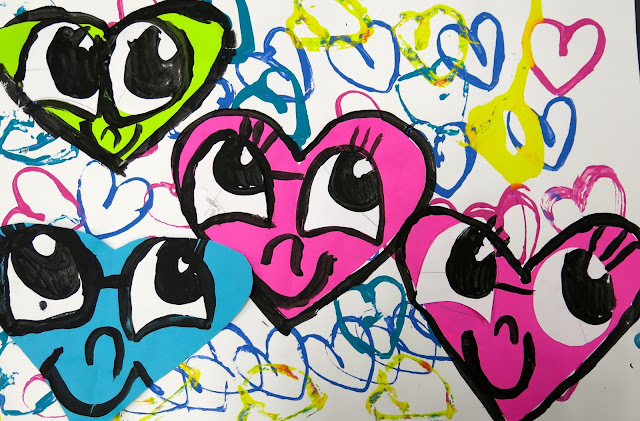 I did this Romero Britto inspired collaborative with my kids when I was out on jury duty. Lesson and video right here. 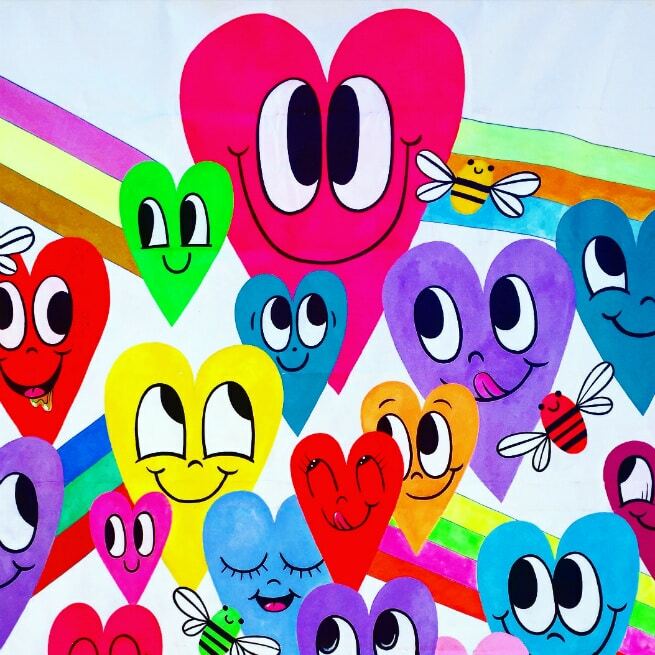 Need something big and happy to spread the love? 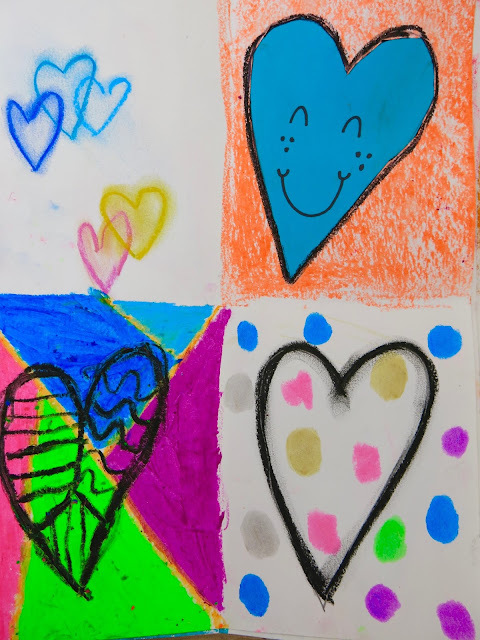 My kids EACH contributed to the Our School has Heart mural. 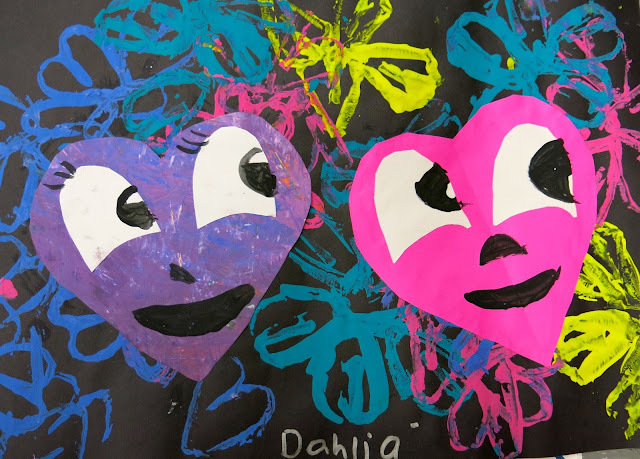 Visit this post to see what each different grade level created for this mural from embroidery to painting to sculpture and needle felting! Boy did we have a ball with this lesson! 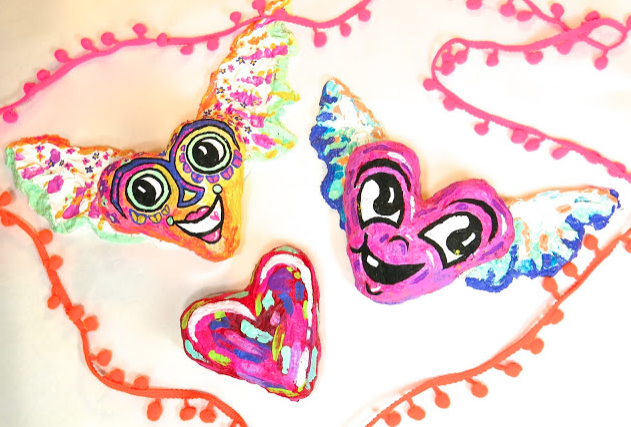 A super fun sculpture project for the kiddos. 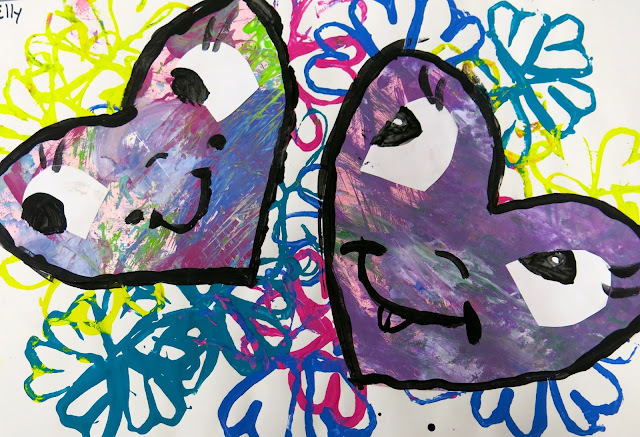 This lesson I created a little while back for my kindergarten and first graders. We loved the printed hearts and the fun guided drawing animals. Video lessons for each critter. 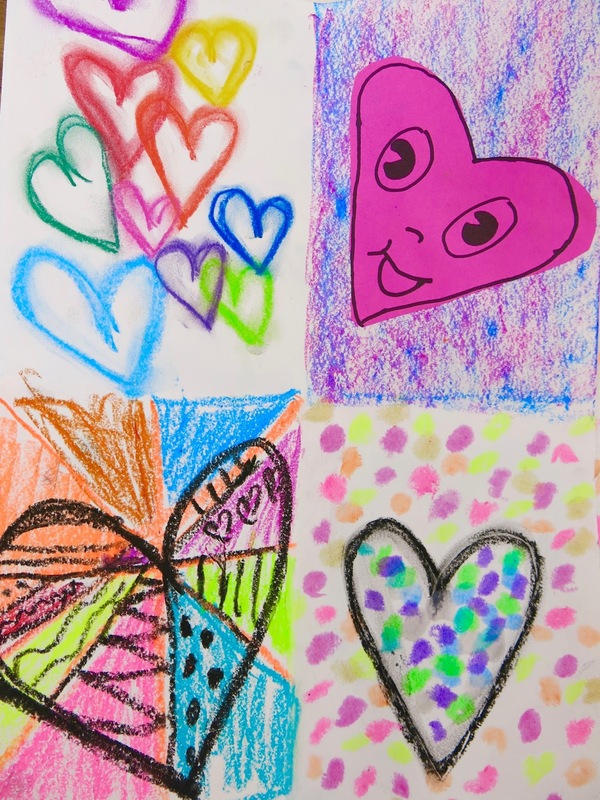 Looking for a fun way to introduce your kids to four contemporary artists who use hearts in their work? This video lesson just might be for you! Oh! 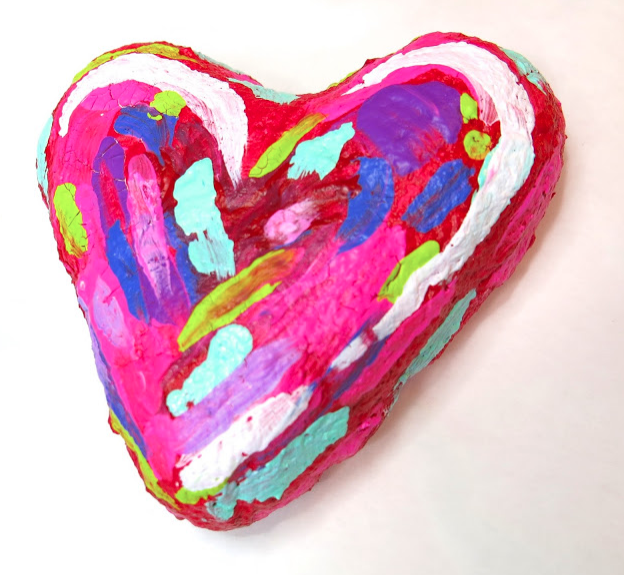 And if you are looking for something to do with your faculty and staff to bring the love, you might want to check out these our Clay Hearts with Wings...a huge hit with my coworkers. Video too! Okay, y'all...that was WAY more than 14 projects so have fun! In the Art Room: Chris Uphues! Well...something super duper and magical happened to me this weekend while I was taking a little trip to Orlando...I got to met Chris Uphues and Jennifer! And having met them, I can tell you, they are just as bright, happy and loving as each and every heart you see right here. Seriously, y'all. 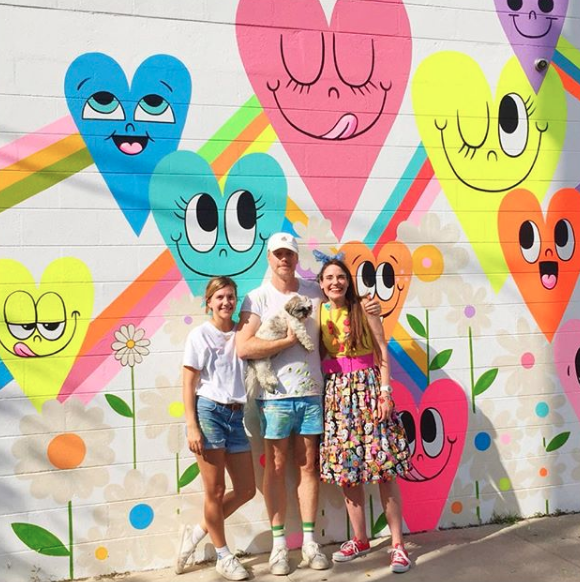 My mom and I sat down with them, totally interrupting Chris' mural painting time, and they made us feel so welcome, happy and warm just to be around them. I've never met two people who were as cute and kind as these two. I could literally hang with 'em all day! When I discovered through some excited messaging with Jen that we'd be in Orlando at the same time, I knew I wanted to make a meet up work. I mean, I've been creating lessons and sharing my love of Chris' work for a while now! Since I'd be meeting them...I decided to have my students learn about Chris while I was away. So...Chris taught art for a pinch while I was gone, even if he didn't know it. Sweet baby Jesus in the manger, there is nothing, NOT A THING, I hate more than prepping for a sub. Can I get an amen up in here?! THAT being said, I did create some drawing sub plans for my kids and I thought I'd share 'em with you. 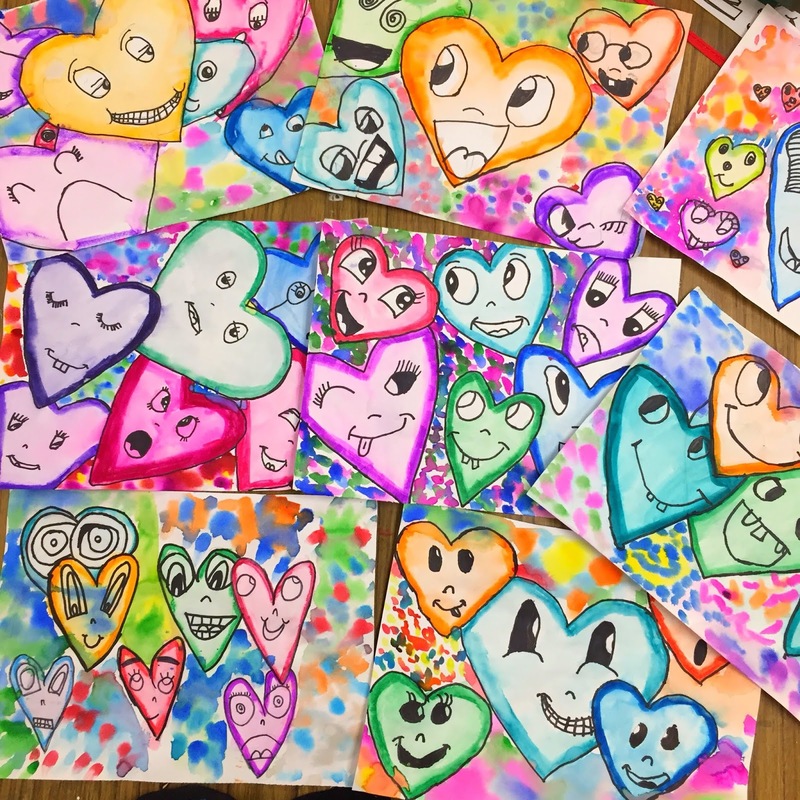 My students and I LOVE Chris Uphues and I am so excited to share this drawing lesson with them. When I'm out, I like to keep my sub life easy: so a lesson for ALL GRADE LEVELS with LIMITED SUPPLIES AND PREP it is! Yippie! Happy sub means happy classroom to return to. I told my sub that the classes that only have 30 minutes will probably only get to the dry erase board sketching. They're also reading the book The Shape of my Heart at the start of art class. For my hour long classes, they will also sketch and then, after a short time, meet again on the floor to view the rest of the video. What's up next for these drawings? Just you wait and see (which is code for I HAVE NO IDEA BUT I'M UP FOR SUGGESTIONS!). Also...stay tuned. I'll create a post in the next day or so with free downloadables of the handouts I created. Until then! 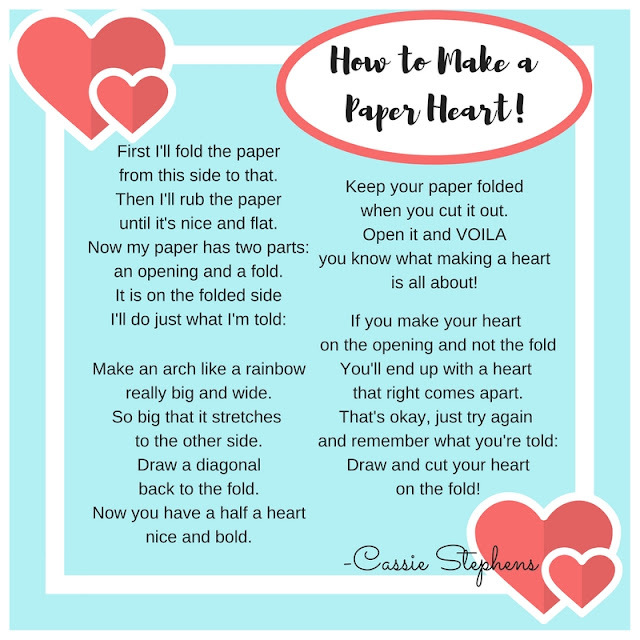 How to Make a Paper Heart with Kindergarten! 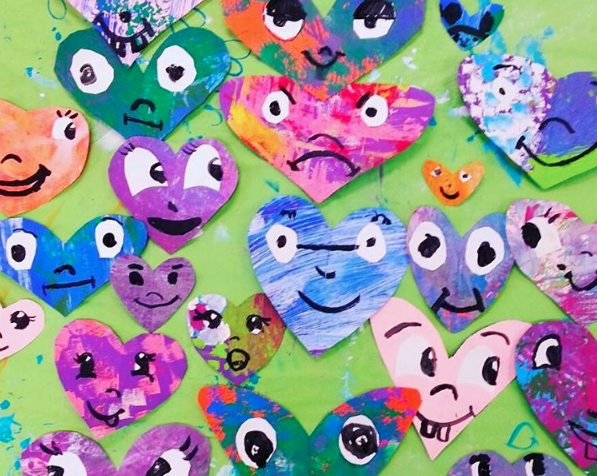 Teaching kids how to make a paper heart can sometimes make you question your life's choices. And that is ESPECIALLY true if you teach kindergarten. 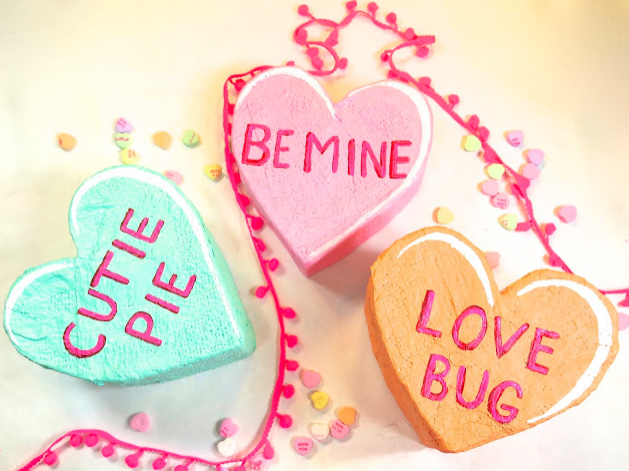 The week of Valentine's Day, I wanted to take a break from our usual projects and teach this skill. Knowing that it might be a bumpy ride, I wrote this poem. It helped me so much, I wanted to share. 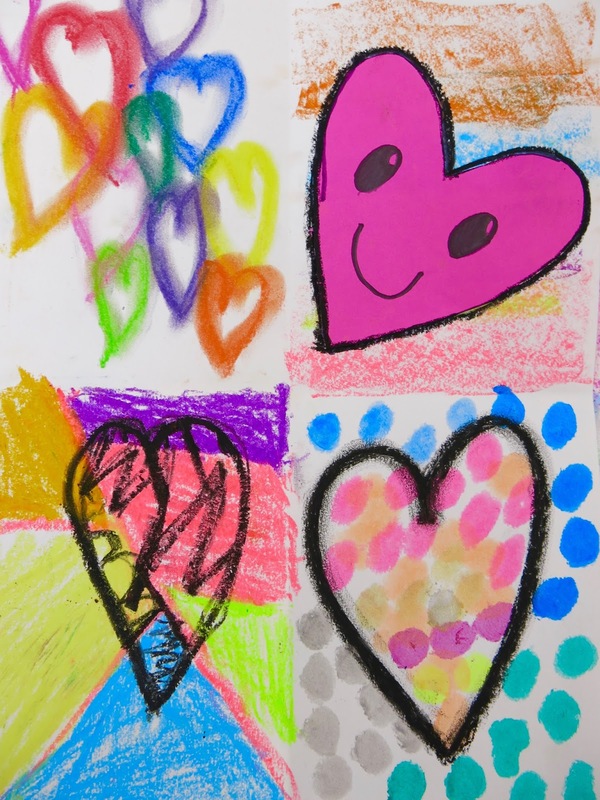 Feel free to use in your art room with any age group of kids! 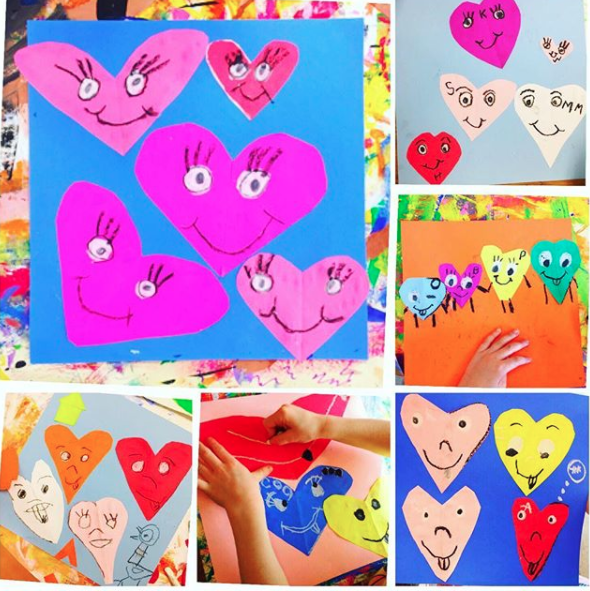 By the end of our 40 minute art class, each student had successfully cut out many hearts. We also chatted about the artist Chris Uphues and added fun faces to these. The kids were beyond excited to create and take these home with them. Just had to share! Hey, friends! Second grade-land has just finished off a fun project with a strong focus on LOVE. My theme this year has been kindness and with Valentine's Day right around the corner, I really wanted to focus on all things love-y. 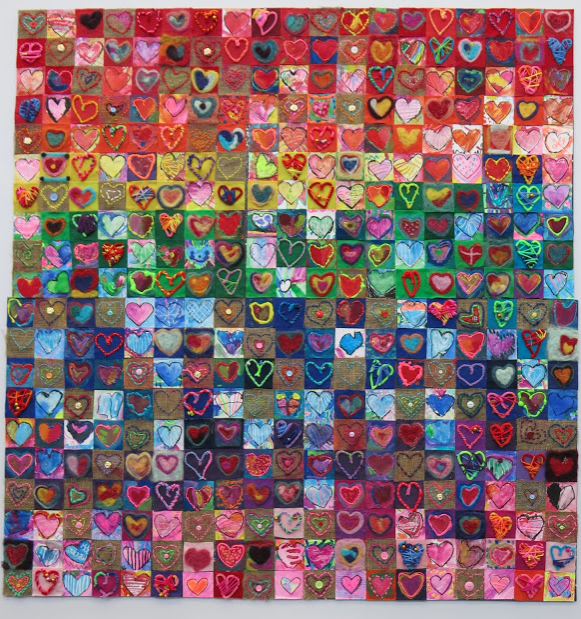 Because, let's face it, the world could use a whole lot more love right now! 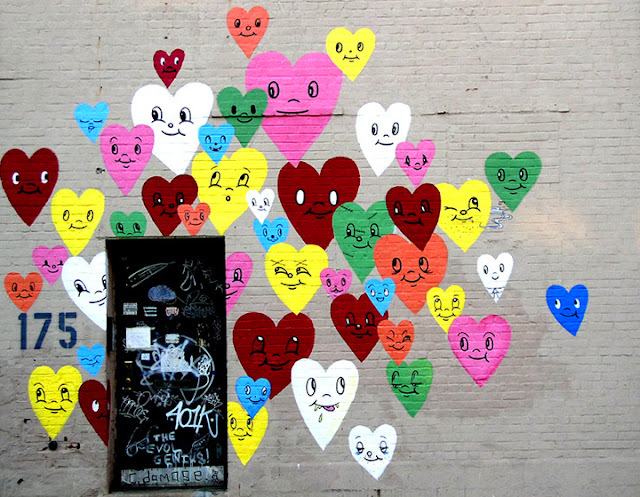 And if these happy hearts don't help spread the love, I don't know what will! Another focus this year has been to introduce my students to more contemporary artists and also street artists. 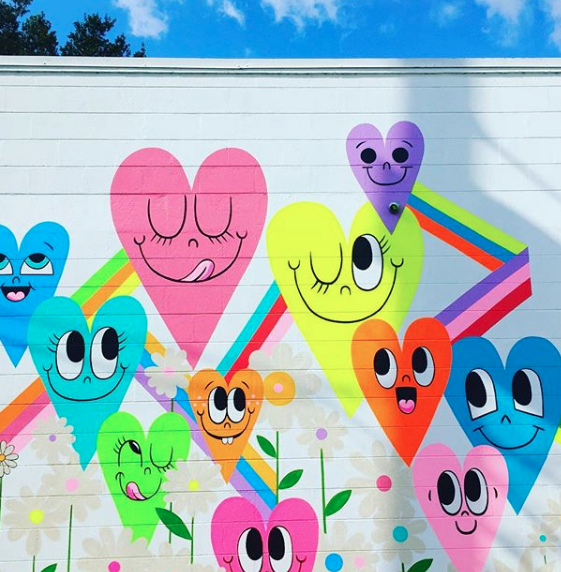 During my search, I discovered the artist Chris Uphues and completely fell in love (sorry, I had to) with his work, especially his happy hearts! 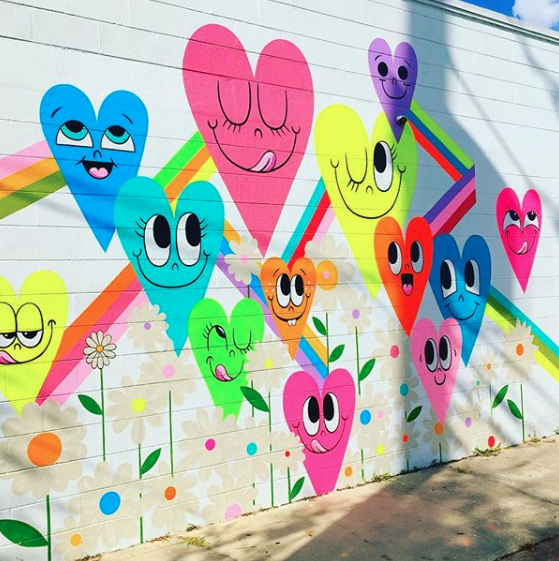 If you aren't familiar, Chris is an artist based out of Chicago whose heart murals can be found there as well as in New York and Los Angeles. 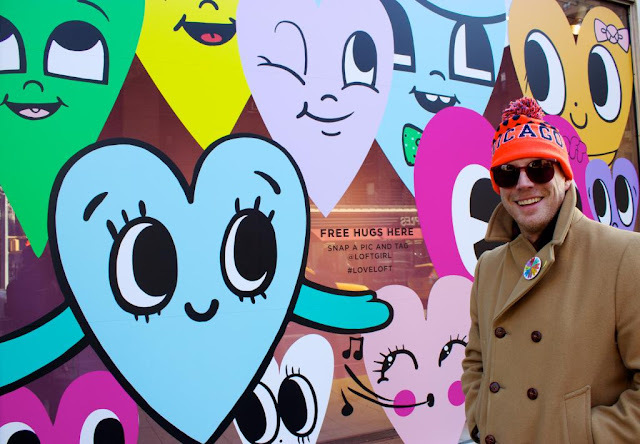 When I discovered his work, I was immediately struck by how happy it made me! I knew the colors, energy and joy in his work would really resonate with my students. Y'all should really check out his website...I love that his hearts can be purchased in the form of reasonably priced prints, patches and pins. I've got a cart full! I would totally cover a wall in my house in these! I mean, who wouldn't?! * Black and white paper, 12" X 18"
I see my second grade kiddos for 30 minutes, twice a week. On our first day together, we chatted about Chris and his work. 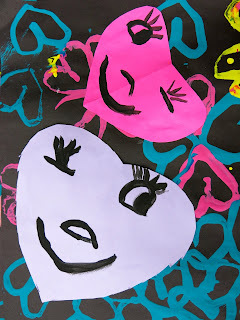 I introduced the kids to printing and we printed a black paper and a white paper full of hearts. 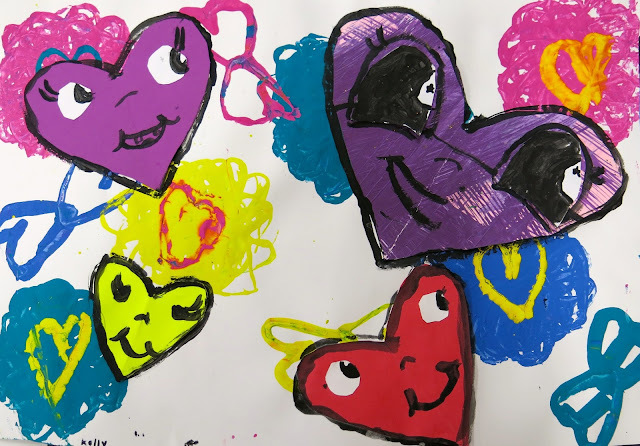 To see how the heart stampers were created, watch the first 5 minutes of this video. 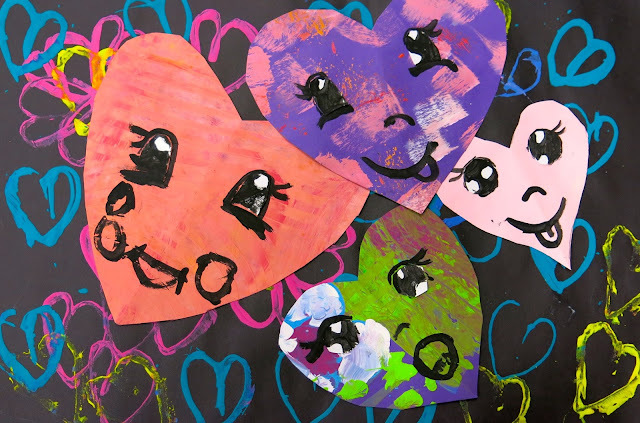 On day 2, students learned how to cut out hearts. Many students knew how to do this already...but I had several that didn't. This was a great introduction to symmetry! I also offered them oval, circle and other shaped templates for the eyes. Once those were glued down, black paint was available for the artists to paint the faces. 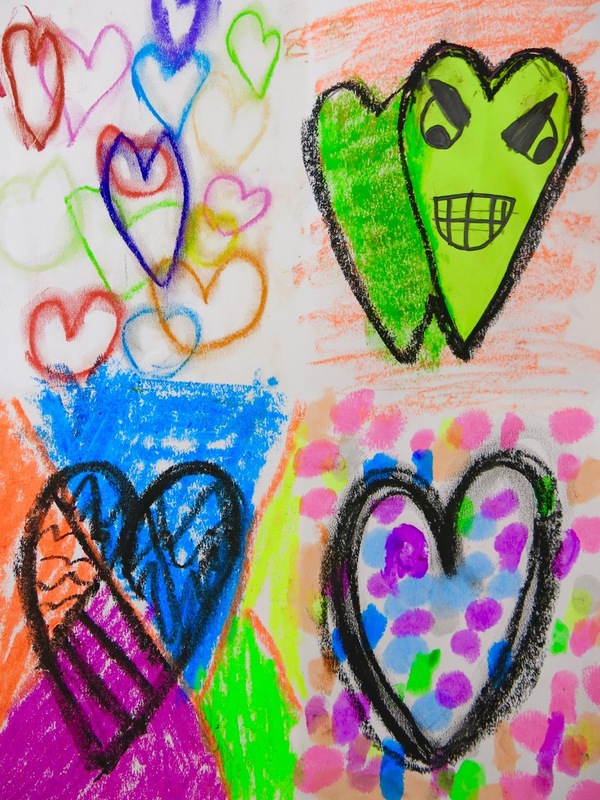 I had printed off several sheets of Chris' hearts to give the kids ideas for expressions. By the end of the second day, we had a ton of these! I love how happy and fun they are. 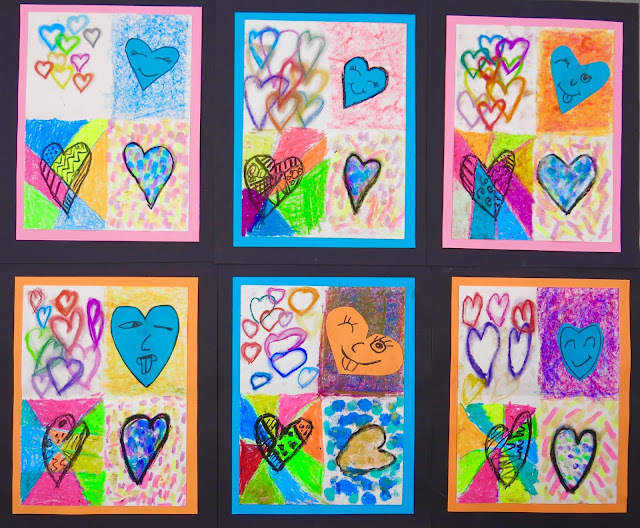 Over the next couple art classes, the kids created more hearts and began adding them to the printed backgrounds. They so enjoyed creating these expressive heart faced characters. 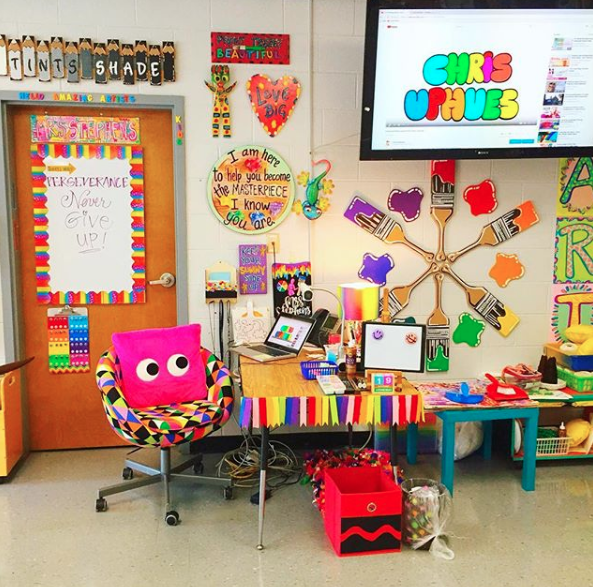 This project was a huge hit with them! 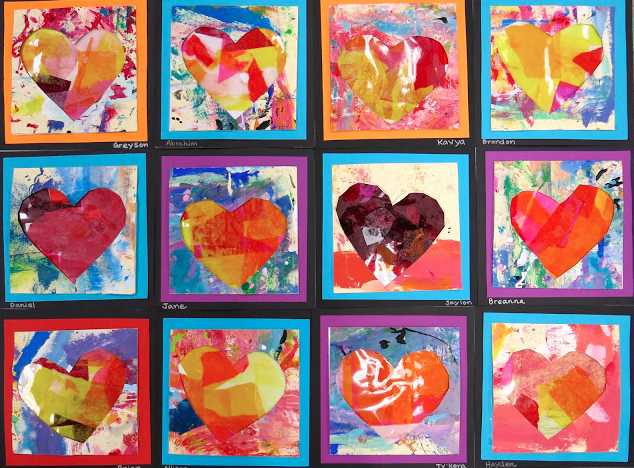 Each kid was super engaged in creating their heart collages. When I told them that we'd be moving on to another project next week, each class shouted "WHY?!" They couldn't stop making these hearts! I just might have to give them one more day to keep on heartin'. 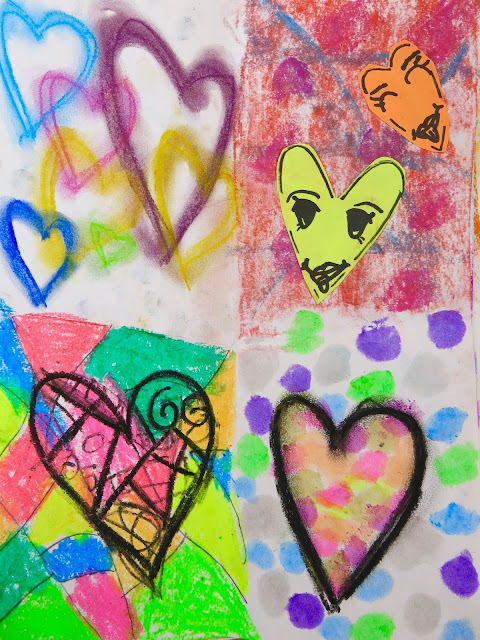 As they worked, the kids had stories about each heart and how they interacted with each other. We had heart moms, dads, babies, grandparents, you name it! As they worked, the kids laughed at their hearts, showed them off to friends and pulled ideas from one another. Before gluing, we did chat about composition, overlapping, emphasis and scale. 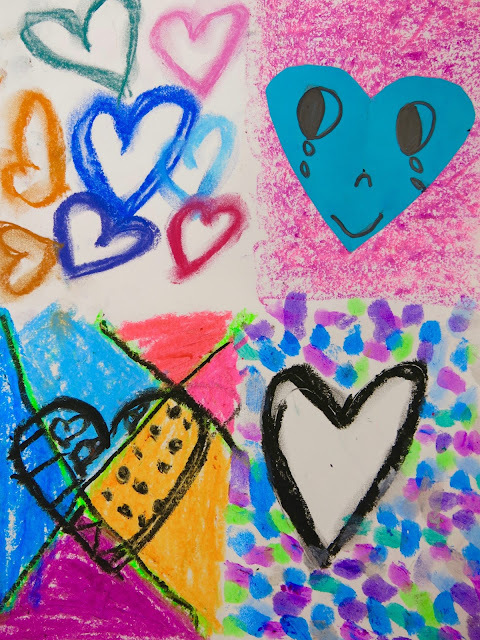 I wanted to remind the kids of these thoughts as they worked...but made sure not to weigh in too much as I really wanted to see where their ideas would take them. Because, I mean...look at how fun and funny they are! I'm so looking forward to showcasing these throughout our school along with all of our other LOVE-based projects. 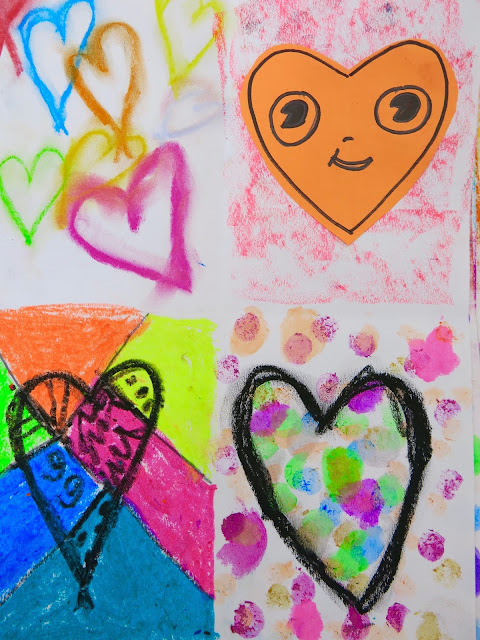 Just a quick scroll through this blog and you'll find half a dozen love-based projects we are currently working on in the art room. The best part is, I've tagged Chris Uphues on several posts showcasing the kids' hearts on my Instagram and he's been so sweet to respond! The kids have loved hearing his positive feedback. It's made us feel all...happy! Like this. 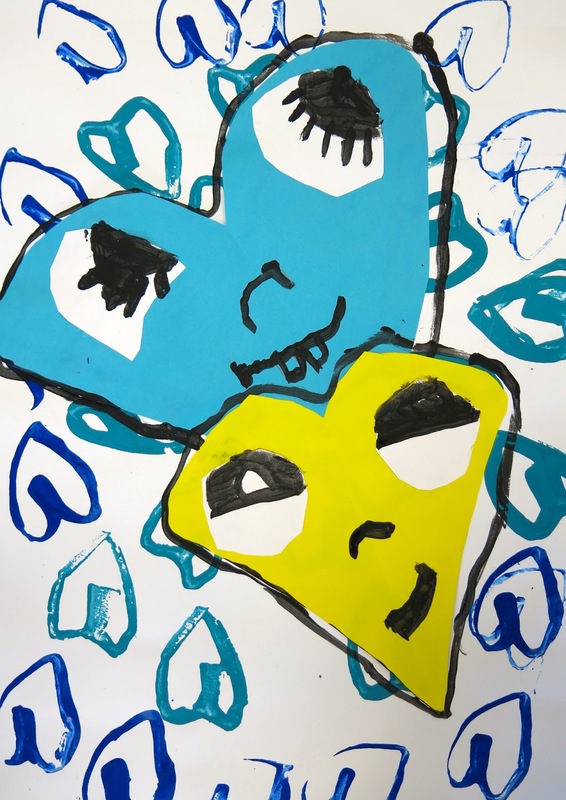 If you are looking for a fun lesson for your students that introduces printing, symmetry, expression, collage and the amazing contemporary artist Chris Uphues, I strongly recommend this fun lesson! Love to hear from you if you give it a go!